“Knowledge is power. Information is liberating.” Kofi Annan. Not a bad place for a hypo! 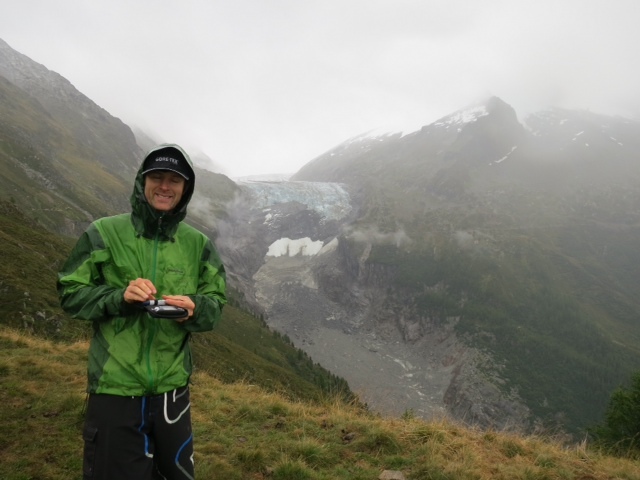 The photo doesn’t do it justice, but we came round the corner of the hill, the clouds parted and we had a spectacular view of the Argentiere Glacier. By testing regularly during exercise, I hope to gain a better understanding of how to manage my blood sugar and minimise risk. I’m not going to reign in my ambitions. Having diabetes makes doing prolonged physical activity a more risky because of the risk of experiencing a hypo (low blood sugar). It is particularly important to bear this in mind when half way up a mountain, because it is hard to get a paramedic up a cliff, and it can endanger the diabetic and his companions. Fortunately, mountaineering is already a risky business involving lots of kit. 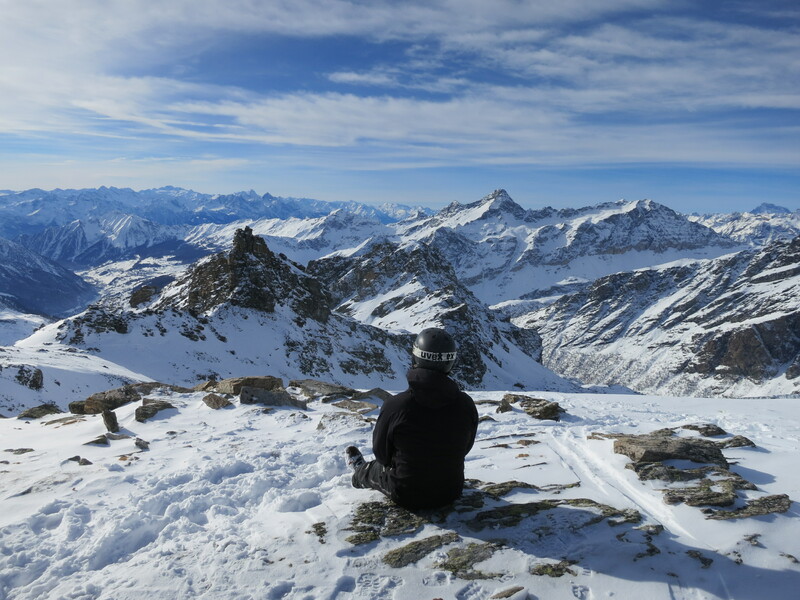 When climbing a mountain, or descending a snowy slope on skis, one has to constantly assess risk of falling, of weather, of avalanches etc. 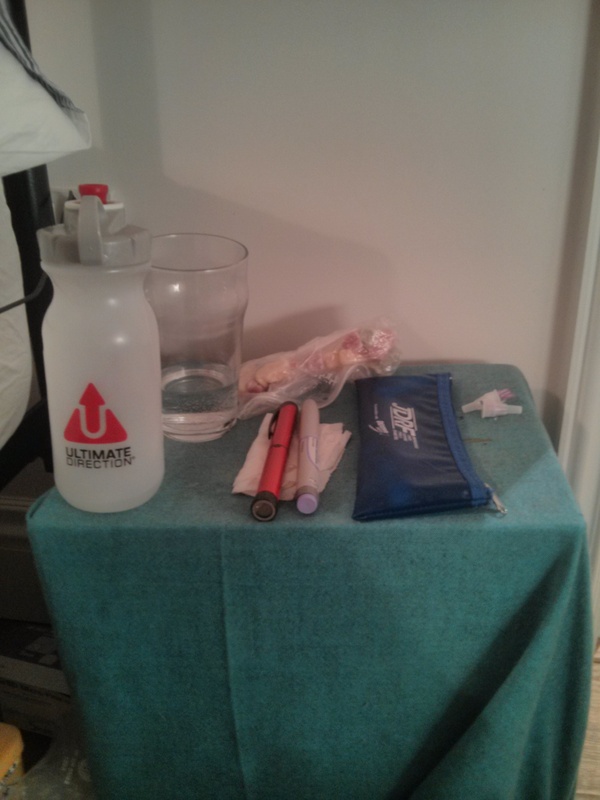 So I already have transferrable skills I can use to manage diabetes – it’s just an additional risk factor to manage, and it requires another load of kit. The desire to keep on doing all this stuff has given me the motivation to learn as much as I can about the condition, and part of that is to collect a load of data. I’m suffering from a bit of “computer programmers block” at the moment and can’t quite decide how best to organise the mountain of data I’m creating every day. The crux of the problem is as follows: a normal person has to eat the right food to fuel their body whilst spending a day running or climbing. I need to do that, but also take the right mix of long and short acting insulin, and the right amount of carbs to stop me from experiencing hypos. I’ve already found, for instance that if I’m running fast (for me, I’m defining a “fast run” as any distance up to half marathon) my blood sugar generally goes up for the first 45 minutes of exercise. If I’m doing less intense exercise, my blood sugar will go down. 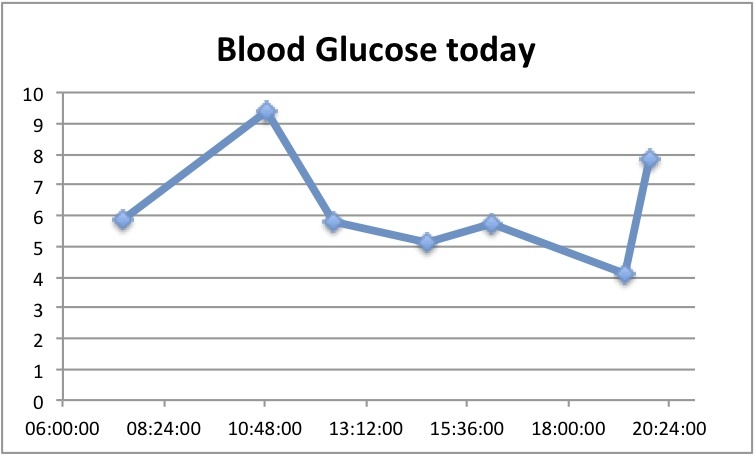 If I’ve taken short acting insulin before exercising (for instance if I’ve gone for a walk after lunch) my blood sugar will drop fairly quickly. It’s all very complicated and whilst my intuition is improving, I think I need to analyse the data more formally as well to give me the best chance of optimal blood sugar control, and decrease the probability of bad hypos. I’ve created some charts to help me. 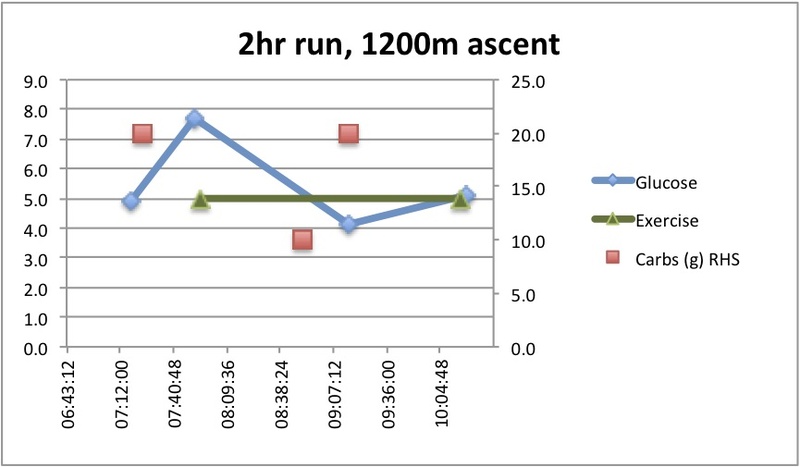 Here’s an example of two runs I did – one half marathon (fast) and one run over two and a half hours which involved a climb of 1200m (slow). 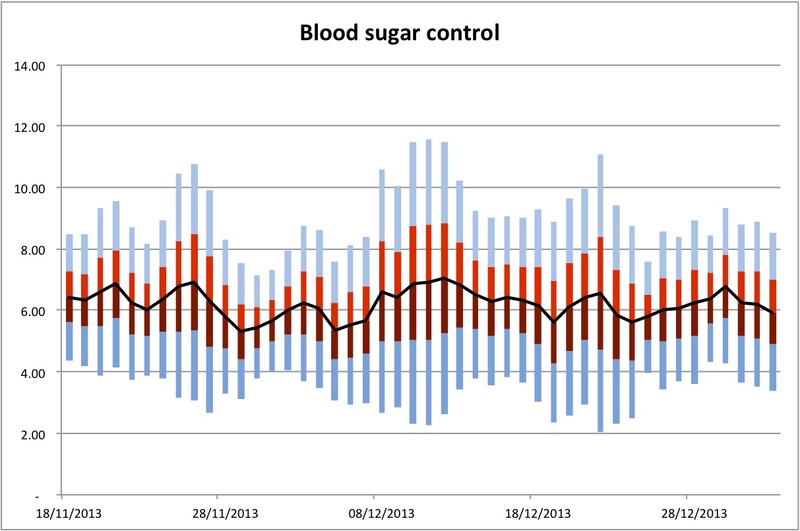 The chart shows how my blood sugar changed depending on exercise and carb intake. 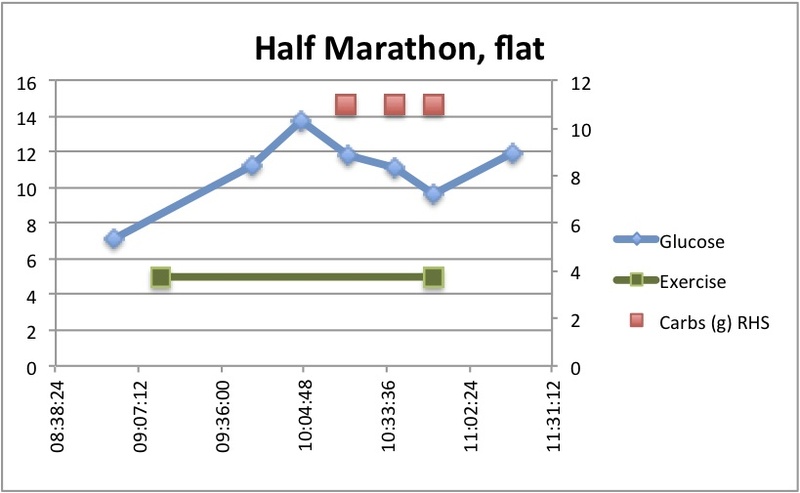 I was running during the period between the green boxes. The blue diamonds show my blood sugar at different times, and the red boxes show how many grams of carbohydrate I ate at different times. Running fast (I have defined my half marathon pace as “fast”) seems to mean that my liver releases glycogen into my blood stream at a quicker rate than I can absorb the glucose for the first 45 minutes of a run. After an hour I started eating jelly babies to prevent my blood sugar from falling too much. This is the same kind of chart, but it was a very different run. I ran for almost two and a half hours, and climbed 1200m. It’s impossible for me to run fast doing that, and from the limited data I have (I didn’t test after half an hour which would have showed the initial response from my liver) I would say that at this slower pace my liver does not release so much glycogen into my system. The data collection will continue, and I’m really looking forward to doing more long runs to find out about my insulin and carbohydrate requirements. *I don’t want to make Dr Powrie sound like a killjoy. It was good of him to manage my expectations. I’m very lucky to have found such a good doctor and I have found him very supportive over the past two months.